"The supremely ventilated, featured and durable Stratos Series receives a makeover that is more than skin deep for Spring 2017. Now featuring adjustable torso lengths for improved fit and comfort with updated aesthetics, the Stratos 24 is the go-to choice for those who prefer panel-loading organization on day hikes in wet or hot environments where staying dry and keeping your cool matter most. When the weather turns, fear not - Stratos keeps your gear and pack protected with an integrated raincover. Smartly organized pocketing keeps all your equipment where you need it, when you need. 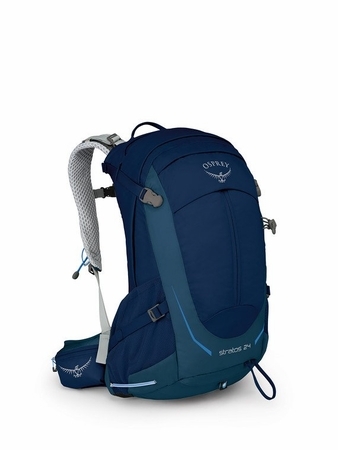 Incredibly comfortable and ventilated tensioned mesh backpanel with added adjustability for variations in torso length to provide fine-tuned customization fit for every hiker and backpacker. Users can't feel seams that don't exist, and because there aren't any on the Stratos/Sirrus updated hipbelt, hikers can focus on the journey instead of the pack on your back. Hope for bluebird weather but know you're covered with our integrated and removable raincover that stows in its own pocket when the sun returns. O/S 1465 in3 / 24 l 22h x 11.8w x 11.8d in. 2.756 lbs "